Shows current, high and low temperatures simultaneously. 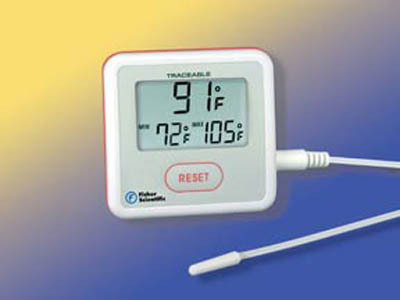 Fisherbrand™ Traceable™ Sentry™ Thermometer instantly shows if water bath, freezer or incubator is within temperature specifications and monitors temperature of any experiment, even when you are not there. Individually serial-numbered Traceable™ Certificate is provided from an ISO 17025 calibration laboratory accredited by A2LA™. It indicates traceability to standards provided by NIST™. Model Provides temp. readings in Farenheit.